Interesting week with our Trustees meeting on Tuesday evening at the centre of it. Trustees liked and approved publication of our Strategic Review 2012, which is some 15 pages long with over 40 references/website links. Trustees focused helpfully on how we would best market and promote the document. I have to polish it and get a new catchier title, and it will be launched at our forthcoming AGM on 8 Nov. Trustees have also agreed the process for rebranding our logo and colours (NOT the name), so this is all positive. The Surrey Sports partnership’s shadow board met on Wednesday to prepare to become an independent body, detaching from Surrey CC next year. Yesterday I met with two member organisations: Windle Valley Youth Club in Surrey Heath, and Eikon. I had two really stimulating conversations about current youth issues and future opportunities which we will want develop and pitch later to other members and then to Surrey CC. I also heard by chance a test run of a presentation by a 16 year old student about the support she had received from Eikon in preparation for its delivery at meeting in London. Very touching indeed, and a very great credit to herself and to Eikon. Now working on the project details of running our first workshop fro young people, funded by Wates, on "how to" get into self-employment, and will use this experience to support the re-submission of our Lottery bid, about which I have had really helpful feedback from the Lottery today. On the domestic front, the whole family is looking forward to the wedding of our youngest son and there is much activity at home about dresses, shoes etc – to be clear- not for me - but I have been deputed to collect 144 pints of fine Ballards (Sussex) bitter. And, Hurrah the rugby starts soon – Eng. V. Fiji is coming up…and clocks go back this weekend. I’ve had my usual busy week, and on Thursday afternoon was just congratulating myself on getting the agenda papers out for our Trustee Board next week, and finishing a 14 page /40 references/links DRAFT “Strategic Review 2012” about issues in the sector- trends policies etc – when I received a vey poignant email from a 14 year old girl about bullying in school. (Hence the title of this piece). She points to the links between bullying, non-attendance at school, self-harm and depression/suicidal tendencies, and wonders what anyone is doing about it? This was for me one of those strange moments in life when I had just written impersonally in the Strategic Review 2012 about the 10% increase in referrals to CAHMS in the last year, and here was a young person making the issue real by recounting her concern about (cyber) bullying, and the consequences for teenagers. We have exchanged emails and she is coming in to see us. I have her permission to refer to these matters, which I know are familiar to youth workers, but I wonder how big an issue this is in school communities? I will giving the issue greater prominence in the Review. We are very busy here and have some 15 projects on the go, and so are now having weekly team meetings to keep up to speed and review progress. The projects include moving from our ancient IT to Fast Broadband and cloud computing, and commissioning an entirely new website. We are project planning the first pilot Surrey Youth enterprise workshop, probably in January to support the re-submission of our Lottery bid. And so on…but I am still troubled by the bullying issue……. A mixed week that began well with a very encouraging strategic discussion at my Chairman’s house with the “senior figures” in Surrey Youth Focus about our future direction. Frankly, the point is that this is a second year of deficit budget and drawing on reserves, and 2013/14 presents some difficulties. We do of course have a cunning plan, which is what we were discussing and will be proceeding with. 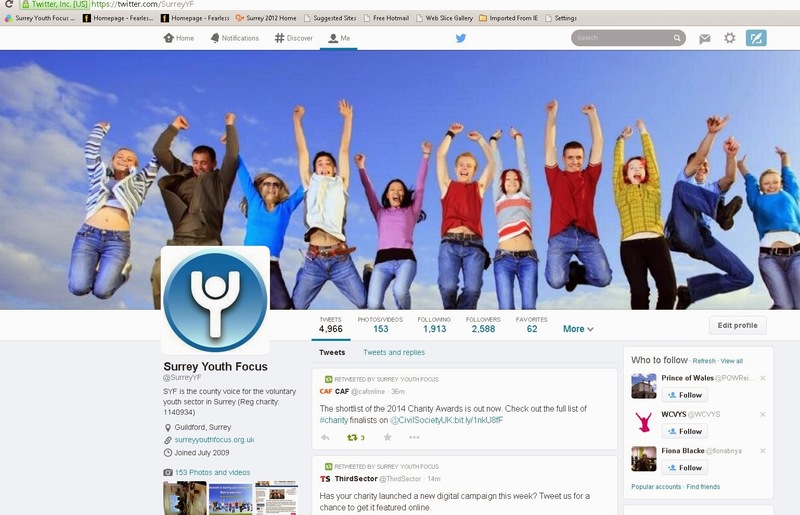 I don’t know any voluntary sector organisation in Surrey that is not facing real difficulties. In our case we are confronting realities and making plans before we end up dead in the pan – like the boiled frog which likes the early warmth and then dies. I then got back to the office to a hugely disappointing letter from the Lottery that our Surrey Youth Enterprise bid was unsuccessful (only 18% of bids are) - BUT I am undeterred and we will be using £10,000 from a GMT to fund a pilot project that can then substantiate a re-submitted bid. However, my pre-occupation this week has been in writing a Strategic Review 2012 (like a PESTLE report ) about political–economic context; policy issues and trends as they apply in Surrey; issues and concerns of Member organisations and young people. It’s shaping up as about 12 sides with a lot of footnotes/references. I know it won’t be of interest to many, but I am hope that everyone who does read it will learn something they didn’t know. Goes to Trustees 23 Oct and published at end of October. Also building up to our AGM on 8 Nov at 6.00 pm at Guildford FE College. We have 6 x 5 minute presentations from member organisations, then a break out discussion/learning, followed by two speakers on funding. One is from the Lottery and the other an expert funding adviser. Hi – the week has been dominated by a rush to finalise our £93,000 Armed Forces Community Covenant bid on behalf of nine uniformed organisations in Surrey, which collectively work with 30,000 young people in Surrey. There are a further 3,000 young people on waiting lists to join the Scouts and Guides particularly. The point of the bid is to increase the capacity of uniformed organisations in response to the evident demand, and to recruit and train more leaders, especially for the military cadets. I am aware of a similar collaboration in London that has received £millions of funding from the Government, but I think our effort is unique outside metropolitan areas. Fingers crossed. We have also put in a small bid with our sister organisations in Sussex to our national body, NCVYS, for workforce development. This Surrey/Sussex bid will enable us to better map provision and market training offers in youth work, and in playwork for younger children (delivered by WSCYS). NCVYS have developed a new “Working with Young People” course in conjunction with the ABC Awarding body, which will be delivered locally by Lifetrain. Guildford FE College, who are also members of ours, are likely to be running a Level 2 (GCSE level) course in Youth Work Practice fairly soon. Meanwhile, I was contacted by a Youth Club this week who are struggling to recruit a (paid) part-time youth worker, so there is clearly a demand for youth workers. However, I suspect the point is that full-time professional youth work jobs are now very scarce and highly sought after, but perhaps fewer people are prepared to work in part-time jobs because of the anti-social hours and other limitations. I helped to co-facilitate a one day workshop here with NCVYS about the Young Foundation’s work on Outcomes Framework for young people. The short version is that the life chances of young people do not depend on academic qualifications, but on their soft skills: relationships, communications, problem- solving etc etc..in other words the key relationships skills that youth workers try to imbue. I have started work on the much-delayed Research Report, which I find really interesting, but hope that there is more than one reader! The point of it is to provide strategic advice to member organisations about the context in which we are all operating, and some of the trends and issues affecting young people. It will be a heavy read but packed with information, and deliberately contentious. It should be ready for Trustees on 23 October (just). All the references will be on the website once finished. As regular readers know I am a Skeptic (sic-Greek) about commissioning…..West Coast mainline debacle?? Off to London on Saturday for last Father/Son lunch with youngest son before he marries in November, and to visit the Tate’s pre- raphaelite exhibition.